The controversial politician and his wife were roasted online for the pictures. Treasury Secretary Steve Mnuchin and actress wife Louise Linton are in the news over money again, but this time at least they're not in trouble over how they're spending it. 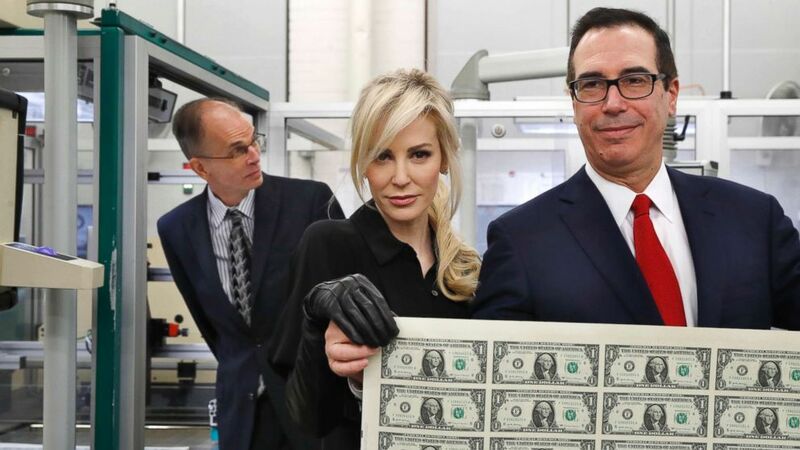 Instead, Mnuchin and Linton are eliciting plenty of memes online over a set of photos with them posing like a couple of James Bond villains as they clutch sheets of newly printed dollar bills. Mnuchin was visiting the Bureau of Engraving and Printing in Washington, D.C. on Wednesday to see the first run of $1 bills featuring his signature. (AP) Treasury Secretary Steven Mnuchin, right, and his wife Louise Linton, hold up a sheet of new $1 bills, the first currency notes bearing his and U.S. Treasurer Jovita Carranza's signatures, Wednesday, Nov. 15, 2017, at the Bureau of Engraving and Printing (BEP) in Washington. 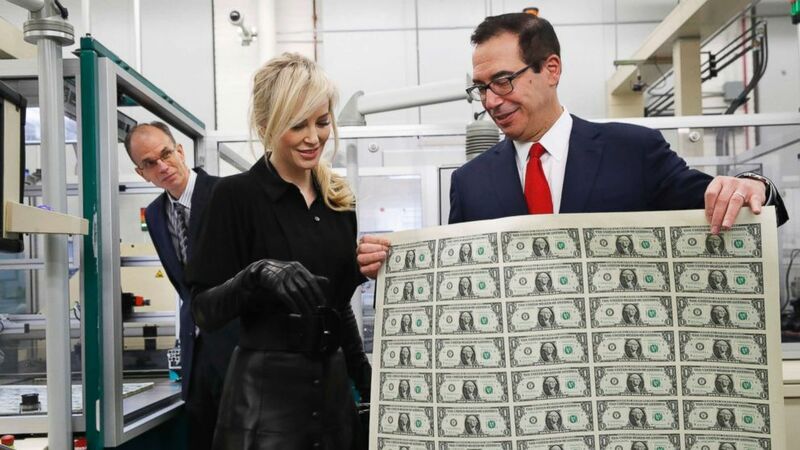 (AP) Treasury Secretary Steven Mnuchin, right, shows his wife Louise Linton a sheet of new $1 bills, the first currency notes bearing his and U.S. Treasurer Jovita Carranza's signatures, Wednesday, Nov. 15, 2017, at the Bureau of Engraving and Printing (BEP) in Washington. (AP) Treasury Secretary Steven Mnuchin, right, and his wife Louise Linton, left, react as Mnuchin holds up a sheet of new $1 bills, the first currency notes bearing his and U.S. Treasurer Jovita Carranza's signatures, Wednesday, Nov. 15, 2017, at the Bureau of Engraving and Printing in Washington. 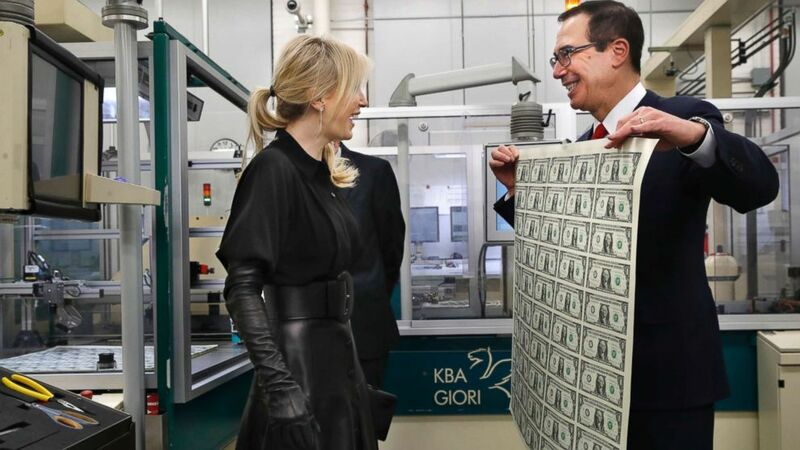 Mnuchin and his wife, who has appeared mostly in brief roles on TV shows like "Cold Case" and "CSI: NY," got in trouble this August when she posted a photo on Instagram rattling off all the designer brands she was wearing on a government flight. The photo of her stepping off the plane had the caption, "Great #daytrip to #Kentucky! #nicest #people #beautiful #countryside," and went on to include hashtags of various luxury designers she was wearing: "#rolandmouret pants #tomford sunnies, #hermesscarf #valentinorockstudheels #valentino #usa." Linton responded to an angry comment from a follower, asking if the person "had given more to the economy than me and my husband?" She later apologized for criticizing the poster. The photo actually touched off a larger controversy over Trump administration officials unnecessarily spending money to take government planes. Mnuchin's travel was scrutinized, including that trip to Kentucky. Secretary of Health and Human Services Tom Price ended up resigning over the scandal, while Environmental Protection Agency Administrator Scott Pruitt, Interior Secretary Ryan Zinke and counselor to the president Kellyanne Conway were all scrutinized.